The Days of Johann, an agility dog! : Had so much fun at the photo shoot!!! Had so much fun at the photo shoot!!! Remember I shared with you that I was going to be doing a photo shoot as part of The Photo Book Projects to help raise $$ for rescue/shelter dogs? Well we did it Friday morning, and it was so much fun!!! 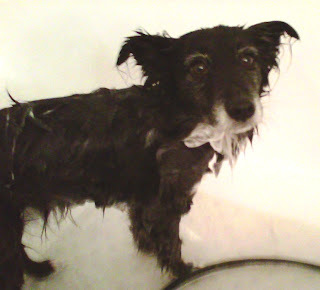 The day started very early at 6:00 AM with me getting the dreaded bath. OK, I didn't want Mum to post this, but here I am getting my bath. Oh the shame!!!! But it is for a good cause, right? At least I don't have adult cystic acne, BOL!!! This is the only and I mean only time you will ever see me in the middle of getting this kind of cruel and unusual treatment, believe me! I had to have my bath early, because I won't let Mum blow dry me, hate that machine. So I had to air dry and it was very humid on Friday, and you know how long it takes Shelties to dry, even ones with less dense coats like me. The photo shoot started at 9:00 AM and I was still drying till about 9:30 AM. So we got started kinda late. During the wait time, Mum found some cool stuff for me to play with. We were at a little room above a veterinary business owned by a friend of ours (haven't found out yet if it was OK to mentioned them). In the room upstairs (which local folks will know about) they do agility classes up there. So there was lots of agility stuff to play with, even though it was all put away. Mum immediately spotted the skateboard, which I am sure they use to help get new pups interested and having fun on moving things. Mum immediately started working with me to interact with it. Dang, I loved that thing from the start! Jumped right on and wheeled across the room with Mum laughing all the way. What fun! I gotta get me one of these!!!!! We started the photo shoot, and Mum worked with me doing tricks and stuff while Melissa McDaniel, the photography, shot away. I did sits, head tilts, stands, begs, lie downs, roll overs, twhirls/turns, and lots more. Then fur fun...Melissa wanted me to get on the skateboard, which I gladly obliged, and then we found a mini teeter, which we worked into the shots too. Then after we were all done, Melissa was gracious enough to get some pics of just me and Mum. We can't wait to see them all!!! Hopefully we'll be able to share just a quick few with you sometime soon. And of course you can purchase the book!!! The book is 15% off the $50.00 cover price right now, so it's $42.50, and $12.75 of that will go to my shelter if you click this link. Cools huh? What a fun, fun day. Long one for me, but Mum was so proud! She said, I worked like a true pro from 9:00 AM until Noon. And then when I got home, I got my zoomie on of course! It did sound like a lotta fun! I hope you get your own skateboard now. How horrid you had to have a bath though! How cool is that? A modeling session all about you Johann! Sorry about the bath though. You look a lot like me when you're wet! I have a feeling, Johann, that you're the one who made you and your mom late, and I'm not talking about your thick coat (I wish I had one like yours), but the fact that, I'm reading between the lines here, you refused to get up at 5:30 to shower. We had so much fun Johann with you and your mom! You were a star and we got some fantastic pics! Thanks for being a part of our book! It looks like you had a great time. We loved the pictures, and by the way, you are really cute when you are wet!